The Shakers as America's Pharmacists in the 19th Century | The Andrews Shaker Collection | Skinner Inc.
During the latter half of the 20th century the American public probably most associated the Shakers with well-made antique furniture. Two quotes are often invoked in association with this. Trappist monk Thomas Merton said “the peculiar grace of a Shaker chair is due to the fact that it was made by someone capable of believing that an angel might come and sit on it.” Conversely, Sister Mildred Barker of the Sabbathday Lake, Maine, Shakers lamented that non-Shakers admired Shaker material culture at the expense of the Christ-life embraced by Believers. Barker’s quote “I almost expect to be remembered as a chair or a table” nicely encapsulates this. During the 19th century, however, the Shakers were probably best known for the herbal and medicinal preparations. Under the influence of Samuel Thomson, as well as Christian evangelical preacher Elias Smith, the American public moved toward the practice of “vegetable medicine.” Herbs were ingested or applied in dry form, or via fluid extracts and compounded medicines. The Shaker physicians and herbalists were known throughout the United States, and even in Europe, for their expertise in growing, drying, pressing, and extracting botanical medicines. Newspapers commonly carried advertisements from merchants selling Shaker herbs, and the name Shaker was a byword for quality. This industry was pursued on the largest scale at New Lebanon. 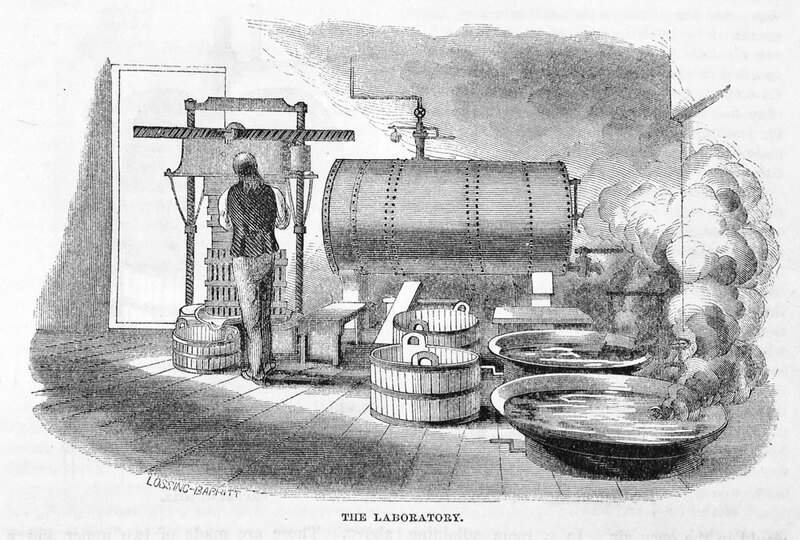 An illustrated 1857 article by artist and journalist Benson John Lossing in Harper’s captured the industry at its height and described the process used to make extracts. In my previous blogpost discussing the “make-do” box constructed of Shaker medicinal broadsides I situated the Andrewses among other early ephemera collectors. The labels offered in the current auction constitute yet more evidence of their commitment to saving Shaker culture, even the most humble and ephemeral items. 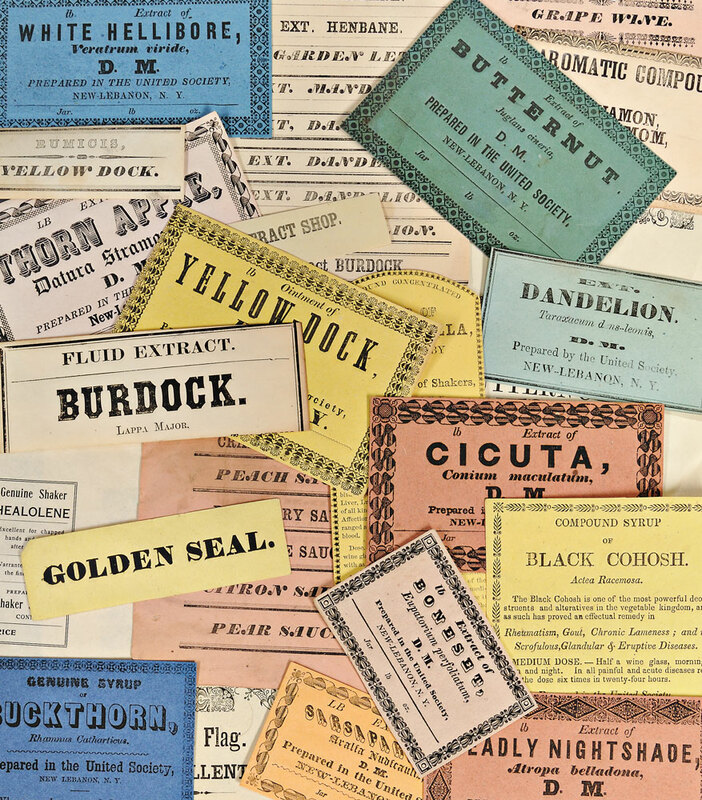 Luckily for those of us who prize the colorful paper and striking graphic design of these labels they have escaped their ephemeral destiny and are now treasured, ironically, as items of enduring value. Benson John Lossing, as quoted in Don Gifford and June Sprigg, An Early View of the Shakers, (Hanover [N.H.]: University Press of New England, 1989), 50. See Andrews Collection, Hancock Shaker Village 1962.473 (New Lebanon) and 1962.474 (Canterbury). This entry was posted in Blog and tagged 19th century, american antiques, Andrews Shaker Collection, Christian Goodwillie, Edward Andrews, Elias Smith, Faith Andrews, Gather Up the Fragments, Hancock Shaker Village, herbal extracts, James Long, medicinal labels, Samuel Thompson, Shaker, shaker antiques, Shaker blog series, Shaker broadsides, Shaker culture, shaker design, Shaker life, The Extract House by Christian Goodwillie. Bookmark the permalink.